Europe's car market looks set to shrink next year, particularly in countries such as Italy and Spain, Winterkorn said. 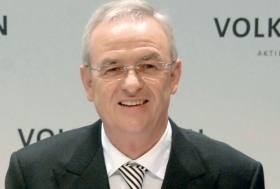 FRANKFURT – Volkswagen AG will face a much tougher business environment next year as demand from countries at the center of the European debt crisis wanes, the carmaker's CEO, Martin Winterkorn, said. "There's no question that 2012 will be considerably harder, mostly in Europe and there particularly in the highly indebted countries such as Italy and Spain," Winterkorn told German business newspaper Handelsblatt in an interview on Monday. The region's market looked set to shrink next year, he added. The head of Europe's largest carmaker also reaffirmed his refusal to sell VW's stake in Suzuki, the estranged cooperation partner that has called on VW to dissolve the alliance. Winterkorn indicated he was willing to stick it out until the Japanese company's management is replaced. "If Suzuki's current management doesn't want to work with us, then maybe the next generation," the CEO was quoted as saying. "No meeting is planned. But if we met we could talk about everything except for one thing. We will not sell our stake in Suzuki," he said. Suzuki and VW on Friday seemed headed for arbitration, after VW refused again to sell its 20 percent stake back to the Japanese carmaker to end a floundering two-year alliance. The two companies have been at odds since VW described Suzuki as an "associate" in its 2010 annual report, published in March. Relations soured after Chairman Osamu Suzuki accused VW of disparaging his company's honor by alleging it had violated the 2009 contract by buying engines from Fiat S.p.A.
Suzuki, which owns 1.49 percent of VW, last month accused VW of violating a partnership agreement by not sharing technology and sent a letter to VW asking it to remedy "numerous" breaches of an agreement. On Friday, the Japanese automaker said it would give VW "some time" before beginning arbitration outside of Japan and Germany on the shareholdings.